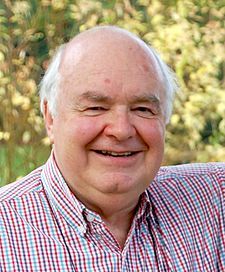 Dr. John Lennox, a math professor at the University of Oxford, visited Seattle recently to respond to Stephen Hawking’s recent The Grand Design (co-written with Leonard Mlodinow). I’ll give a brief summary of the main points Lennox made with a few comments. Christian apologists like to focus on the beginning of the universe, sensing a weakness in the naturalistic model. When asked about what came before the Big Bang, Science simply says, “I don’t know.” This is neither a weakness nor a reason for embarrassment. Instead, it points to those areas in science where more work needs to be done. But this statement by Hawking gives at least one resolution to the question. 1. Hawking says: “the universe can and will create itself from nothing.” But the law of gravity is not nothing. 2. “… The universe creates itself from nothing.” But “I explain X because of X” (that is: the universe creates itself) is Alice-in-Wonderland thinking. 3. A law of nature (like gravity) depends on nature existing. Let’s accept Lennox’s claim: Hawking’s claim is clumsily worded. But it’s just a few sentences from a 200-page book. What about the rest? Might that clarify and defend this claim? This is a caltrop argument—a defensive argument that doesn’t address a question but dismisses it. Lennox doesn’t respond to the claim but rather spends much of his lecture arguing that he doesn’t have to. Weak. I’ll gives the highlights of some of his other arguments and observations. He says that religion can answer the big questions. Sure, but so can anyone. Just because religion has an answer doesn’t make it right (and Lennox made no attempt to pursue this). He pointed out the limitations of Science. Sure, but don’t imagine that Christianity has anything better. He said that Hawking makes a God of the Gaps argument—as the explanation “God did it” gets crowded out of different fields of science, God has no place to reside but in the shrinking gaps between knowledge. Lennox argued that this isn’t the God of Christianity. Sure, then seize the opportunity to side with Hawking and agree that Christians shouldn’t use this kind of thinking. He pointed out what he saw as a false dichotomy popular among atheists when they demand: choose God or science. He responded that these two are complimentary, not contradictory. Lennox’s argument was something like this. Imagine someone saying, “Henry Ford or mechanical engineering caused the Model T car. Pick one.” Of course, the Model T was caused by both Henry Ford and mechanical engineering; it makes no sense to demand that only one can be a cause. Similarly, only a faulty understanding of God makes the “pick one” dichotomy make sense. For example, Isaac Newton happily accepted both gravity and God. To me, this sounds quite different from Stephen Jay Gould’s model of Non-Overlapping Magesteria (NOMA). The different viewpoints could be: (1) Gould’s NOMA, where science and religion don’t overlap, (2) Lennox’s view, where they overlap contentedly, and (3) Richard Dawkins’ view, where the overlap but science trumps religion. Laws describe and predict but don’t create anything. Consider “the sun rises in the east,” the law of gravity, or M-theory that Hawking refers to in his book. These can’t create anything. So what created gravity? My response: Science doesn’t know. But if Lennox can rest easy with no explanation for where God came from, surely this scientific puzzle doesn’t trouble him. Nearing the end, he touched on the Design Argument and Fine Tuning Argument without defense. He said that God is a threat to atheists (so are atheists hedonists then?). He said that a multiverse model, in which vast numbers of other universe exist alongside ours, doesn’t exclude God (OK, but “you haven’t excluded God” is hardly strong reason to believe it!). The Discovery Institute was a sponsor of the event, and Lennox recommended their books. Et tu, Professor Lennox? What does it say that evolution denial is almost a requirement for speaking in a church in America? His last argument compared a single universe created by God to the multiverse. He said that the former is simpler. That’s hard to swallow, given that “God” is about the boldest assumption possible, and he’s made that assumption without evidence. In his last broadside against Hawking, he said that Hawking’s atheism undermines the foundation of science. “Atheism is a fairy story for those afraid of the light,” he said, to enthusiastic applause. Lennox started the lecture with science, but it devolved into a sermon at the end, including a long quote from the gospel of John. To be sure, the lecture was held in a church, but let’s make a clear distinction between a scientific lecture versus a sermon to like-minded believers. We can have Professor Lennox, famous Oxford mathematician, speaking in the domain of science and reason, or we can have John Lennox the Christian preaching to the choir. Trying to have both undercuts the scientific platform IMO. This summary is of the John Lennox lecture “Do the Laws of Physics Make God Unnecessary?” at University Presbyterian Church in Seattle, WA on 8/19/2011. This entry was posted in Cosmology and tagged Big Bang, caltrop, cosmology, Discovery Institute, evolution, Gould, Hawking, Lennox, NOMA, The Grand Design by Bob Seidensticker. Bookmark the permalink. In “The Grand Design” Stephen Hawking postulates that the M-theory may be the Holy Grail of physics…the Grand Unified Theory which Einstein had tried to formulate but never completed. It expands on quantum mechanics and string theories.